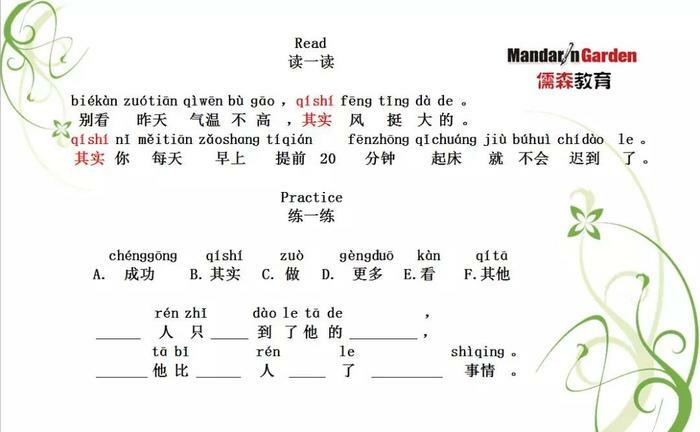 ​【Chinese Corner】How to use "其qí实shí（actually）" in Mandarin? 【Chinese Corner】How to use "其qí实shí（actually）" in Mandarin? Mandarin Garden cooperated with well-established software designing companies, to develop a Mandarin E-learning System with abundant course ware and flexible methods which will be the coming popular way of learning Chinese. The combining of traditional class and online class, online courses and a mobile platform (IOS, Android, IPAD) raises Chinese learning to a higher level. Now, enter "www.360emandarin.net" in your browser or scan QR Code and make an appointment for free online demo course.